Guinea-born guitarist Alpha Yaya Diallo and bandmate Bojou Cissoko brought intricate, traditional African music to the Clock Tower Theatre on Sept. 11 as part of the Live at TRU! concert series. 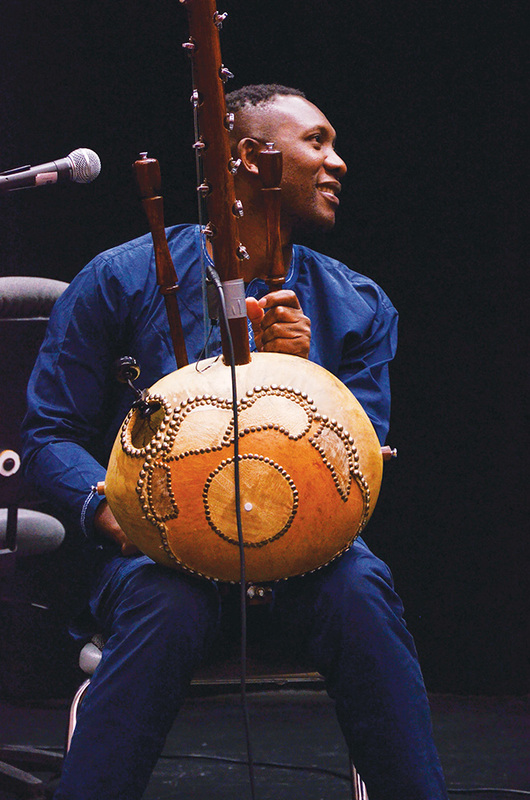 Diallo used two different guitars during the show, while Cissoko played the kora, a traditional 21-string instrument used by the Griot people of West Africa. Diallo and Cissoko walked out on stage to a warm welcome from the audience. Diallo offered a soft and grateful “thank you” to the crowd, and with that, they launched into their dream-like performance. Diallo played intricate notes and made it seem absolutely effortless. After the first song, the audience was on their toes. The second song was just as well-received, with tapping feet and rhythmic clapping to the song’s beat. The complex and precise performance set forth an assault on the audience’s musical senses. Let me be clear, it was an immensely enjoyable set. However, for someone who has never experienced live African-style guitar and kora playing, it was overwhelming, but in a good way. Toward the end of the show they encouraged all to go to the upper level and dance. “It’s very hard to listen to African music without dancing,” Diallo said to the crowd. Diallo and Cissoko possess a magnetic and energetic compatibility on-stage. At times, it felt like more of a private jam session than a concert. Throughout the set, the two musicians glanced back at each other and frequently let out a yell of approval or encouragement. Diallo has been playing guitar since he was seven. With a degree in genetics, he wasn’t always sure if he would perform for a living. But he always loved music and growing up. He was surrounded by it. “I grew up, first of all, in an environment with a lot of music. All types of music, from jazz to blues. I mix that with African styles. I get inspiration from nature, travelling, from love! I get inspiration from ladies too!” Diallo said. Diallo and Cissoko certainly set the bar high for the rest of the upcoming performers in the Live at TRU! concert series.